We'd finally gotten enough of making ourselves sick eating cherries last week, and it was time to harvest the last of the cherries and call it over. 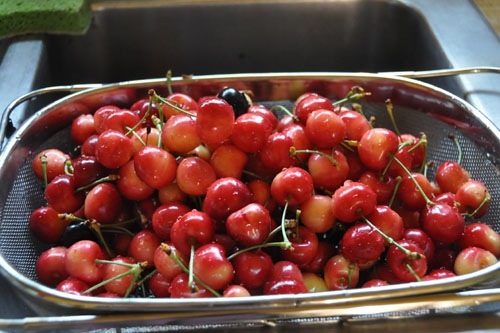 So on Sunday I climbed up the cherry tree and harvested what was left to make maraschino cherries. There were a lot of slightly-pecked or chewed cherries, but these were the good cherries I got (the rest got thrown on the ground for chickens and dogs to clean up). They're mostly the Lamberts, though there are a few Ranier and a couple Black Tartarian in there. 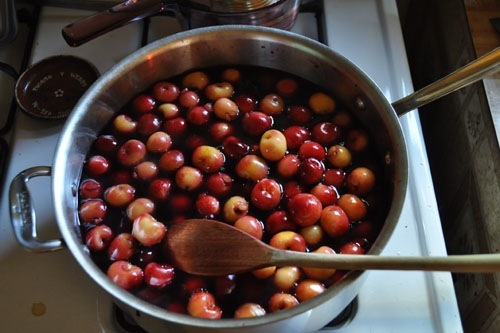 I washed and pitted the cherries, and removed the stems because I didn't want to deal with them. Those two steps, the picking and then the pitting, took the most time of this whole process, though of course bringing the water bath up to temperature took quite a bit of time as well. There are two kinds of maraschino cherries: real ones, made with maraschino liqueur, or simply flavoured canned cherries made with syrup, juice, and flavourings, of the sort you would not feel degenerate giving to a child. I made the latter, starting with a recipe I found online. I figure kids are the number one consumers of cherries in syrup, anyway, so I might as well make them be child-friendly. Though of course they are just loaded with sugar, so maybe the child-friendliness is an illusion. Per the recipe, the cherries were soaked in a syrup made of simple syrup and blueberry juice (I couldn't find cherry juice at the store and didn't want to dig around for it, and I am no fan of concord grape juice), plus some lemon juice, vanilla, lemon extract, and dibs and dabs of other flavourings I had in the pantry. This was actually a good time to review my candy flavours and throw a bunch out, since they do not last forever. Sometimes I forget I've been alive long enough for a flavouring to go south on me, if you know what I mean. I considered putting a colouring in there to jazz them up, but decided against it for various reasons. It always seems like it would be fun to make coloured foods, but I really prefer to eat things that don't taste like food colouring. Maybe next year I can make a version that is naturally coloured with mulberries. Then I canned the cherries up in 1/2-pint jars. 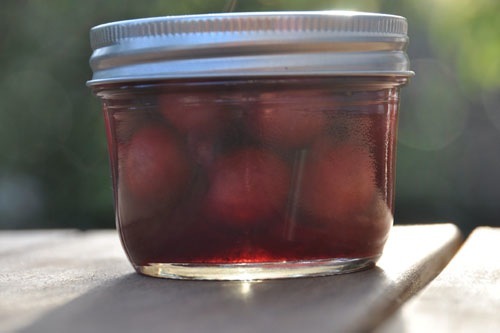 A nice small size for gift-giving or a party, not so big that you feel a real pressure to finish the cherries. There was also an extra pint or so of the syrup left over, which I canned into a jar as well for making sodas.